He is a 12 year old Thoroughbred gelding that stands 17.3 hands tall. While Goofy did not have any diagnosed injury or illness, when he came into the program we observed severely disconnected, crooked haunches with a severe medial deviation in the flight of the left hind leg, and marked mechanical unevenness in his movement. His way of going was hard, stiff through his topline and lacked the round softness that makes even a horse of this size an easy ride. Goofy's program has included extensive chiropractic care, acupuncture, magnetic massage, and careful monitoring of his fitness and work program. 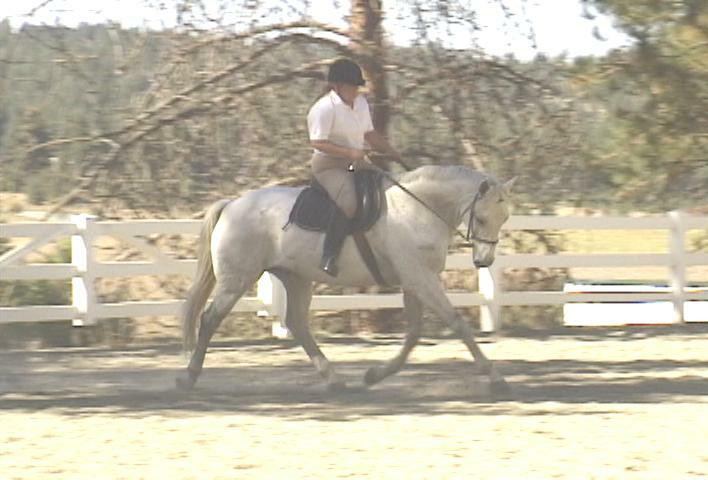 After a year in the program, we now see some connection through his topline, and swingy movement that is more forward, relaxed and balanced. At times Goofy's trot is even sittable!